Internet advertising for the first half of 2007 hit $10 billion – up 27% from the same period last year, according to a recent Internet Advertising Revenue Report released by the IAB. Even though the various types of Internet advertising still make up only a small percentage of the overall ad industry (about 9.5%), the growth of Internet advertising is predicted to be 85% between 2006 and 2009. 85%!!! That is a huge amount of growth. Things are shifting and the print world is going to have to adjust, the faster the better. I’m at Logan Airport in Boston, heading out on a weekend trip to visit my friends in Baltimore, and I just ran across the final issue of Business 2.0 and had to buy it. Reading the final issue of this magazine is going to be like saying good-bye to an old friend for me. I can’t say that I read every issue since the magazine launched almost a decade ago, but I was a subscriber for years, particularly during my time at executive editor of Publish magazine when I would read every issue from cover-to-cover and stick post-it notes to its pages when an article gave me inspiration for a story. (That happened often!) 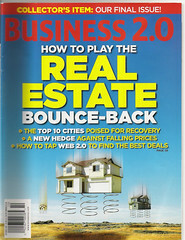 During those days, Business 2.0 and The Industry Standard were the print publications to beat. The boom was, well, booming and marketing dollars were flowing toward both of these publications – it was not uncommon for a single issue to have up to 600 pages. At the time, if even the shadow of Business 2.0 fell upon you, you were blessed. So we transitioned the audience of Publish magazine from “graphic designers” to “Internet communication professionals” to try to share a tiny bit of the space. The magazine continued to inspire media ventures through its years, including Michael Arrington’s, who writes, “The story style and content was a big inspiration for starting TechCrunch, even though we are a poor imitation and rarely do it justice.” I could not have put it better. I have a tremendous amount of respect for that publication and really fond memories of those days before I moved full time to the Internet. So long, Business 2.0. I’m sad to see you go.